I’ve just recently finished Eric Ries book, The Lean Startup, and wanted to try and unpack one of the core concepts in that better than I previously have. This core concept is the idea of the Value Hypothesis AND the growth hypothesis. There are two varieties of hypothesis? I’ve read and followed the #leanstartup movement for a couple of years, reading many of Eric’s posts on the subject and attending the Lean Startup Circle events here in Sydney through most of 2010. However, we (or perhaps just I?) always seemed to be attracted to the more shining lights of the method…The MVP. The Pivot. The vanity metrics. These things are important, but reading the book has highlighted some of the more subtle and crucial parts of the method that I missed in the first few years. Especially, Eric seems to present us with the idea of the Growth Hypothesis with more clarity than previously in his blog. Others agree with me on this. In this post, I want to focus on the Value Hypothesis. I’ll cover the Growth Hypothesis later. The value hyptothesis is probably best defined by Eric himself. Essentially, it’s what you understand will drive the customer to want to buy or use your product or service. What is the value that people will get from the thing you build? Importantly, though, it’s how you go about testing this hypothesis that really matters. I wrote a post a while ago about forming a hypothesis and that still rings mostly true – the thing I missed was how this leads to success and the important of defining your baseline metrics to understand when you’ve learned something valuable. Step 1: What’s your value hypothesis? The first step would seem to be defining what you perceive people want or need. An example I can talk about is the app I launched last year, Smo.ulder.in. Smo.ulder.in provides people with an export of all content from their Campfire chat rooms. I realised this was a problem when I myself needed to export everything for compliance reasons and wasn’t able to. The value hypothesis in this case, was that people would want to download their content to have a separate place incase of being audited or canceling the service. After 1 year of slow learning and about 30 customers later, I’d say I’ve proven the basic hypothesis. That people do want to download their stuff and they are willing to pay for it. The problem is, I haven’t been able to gauge my success that much because I didn’t have any idea of the baseline results I wanted to see. Is 30 enough? Should it be? I didn’t think through this at all. This is another aspect that has jumped out upon reading the book again. 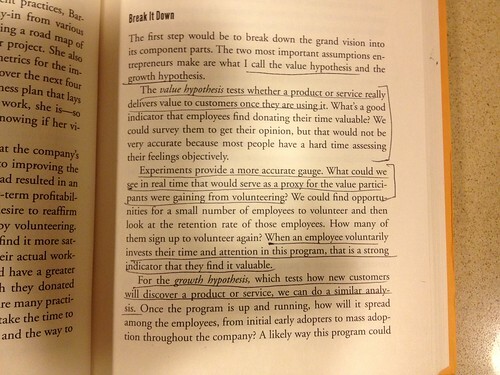 It’s simple, but I didn’t appreciate it enough when I first worked through the #leanstartup stuff. If you don’t know what success looks like, it’s hard to assess whether you’ve actually learnt anything. Now, smo.ulder.in has broken (the API changed) and I’m unsure of what to do with it. Campfire didn’t offer that feature, so I decided to commision Pat to build it. I wrote a post all about this when it happened. I was pretty happy with the quick launch and turn around and enjoyed actually seeing people use the service. We got people using it and testing out value hypothesis. In closing, I’ve learnt to appreciate the value hypothesis much more and plan on using it in my work and other projects. Asking myself what value I believe I’ll be providing ahead of time and then outlining the baseline metrics I expect to see move are things I’m going to work on. Creating an MVP is the fun part and something I’m more familiar with but learning how to learn about your progress is thing which has stuck out as most important after reviewing the book. It’s from there that you can pivot or tweak your growth hypothesis to continue developing your idea. It’s also worth stating that you don’t need to be applying this framework to just online startups. I’m going to begin applying it to my blog, to better learn the framework and the value of following it. Next Post Don't plan. Be prepared. Great reflective post. It took me a long time to figure out the importance of validating a growth (distribution & pricing + demand creation) hypothesis, even though I thought I had read and thought I understood the principles in Blank’s Four Steps. That combination of defining a growth hypothesis and actionable metrics to validate/ disproove is a lot tougher and more subject to bias than I could have imagined.